You only have to mention the word "blind bag" or "collectible" in our house and both James and Evelyn get super excited. So when I heard about a new kind of collectible we just had to try it out. 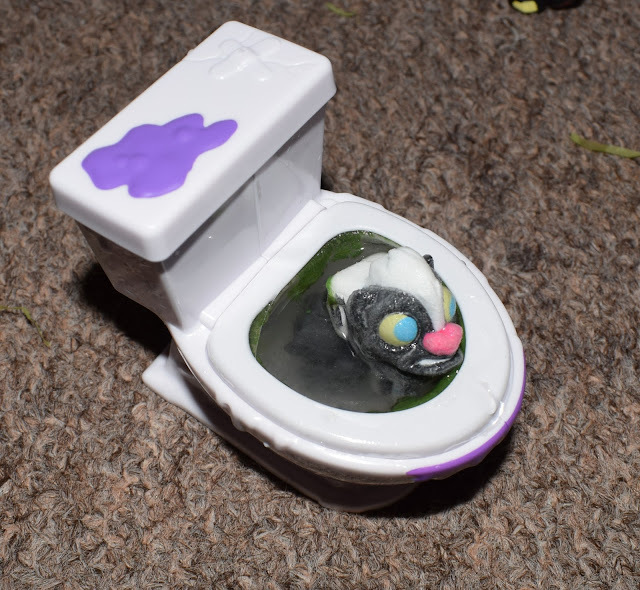 Flush Force are gruesome new collectibles you will find lurking in their very owl toilet bowls! But these are no ordinary blind bag's in fact Flush Force characters are hiding behind a brand new "flush to reveal" technology, making opening these blind bags even more exciting. There is a whole range of Flush Force collectibles which includes the Number 2 Pack (£2.99), Filthy Five Pack (£5.99), Bizarre Bathroom 8 Pack (£10.99), and The Collect-a-Bowl (£14.99) all of which contain mystery characters. 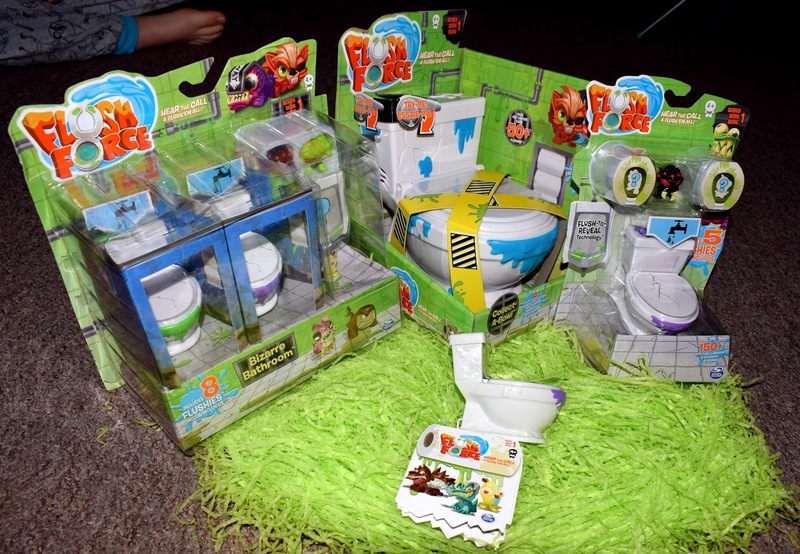 All the above feature the "flush to reveal" technology except the collect-a-bowl which has standard blind bags inside. The "flush to reveal" technology was something the kids were so excited to try out and it didn't disappoint. To discover which character is lurking inside the toilet you need to add water to the top of the toilet and SHAKE! The question marks you first see on the top of the toilet seat will disappear revealing your character inside. 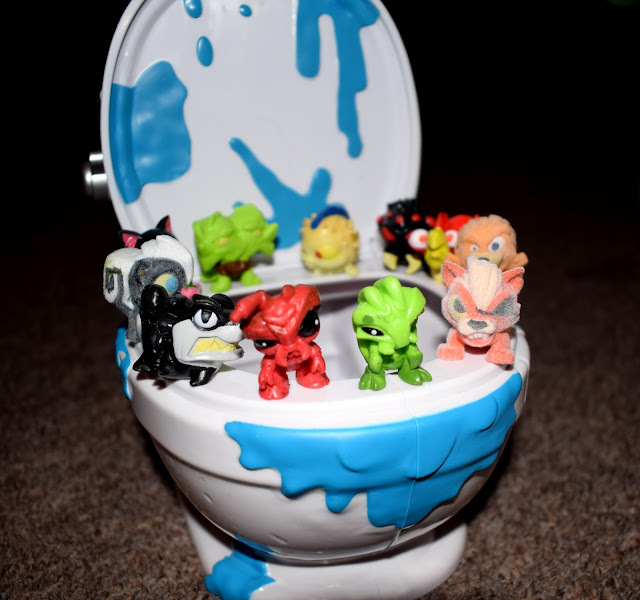 The Flush Force characters come in 7 different finishes which include floating, see through, squishy, regular, metallic, colour change and flocked so you never know which character you will pull from the toilet next. My two loved the flocked characters the best, which are nick named scuzzy fuzzy's on the collectors leaflet where you can tick off your collectibles as you get them. The Collect-a-bowl is another fab idea as it not only contains four exclusive characters but can then be used to store your Flush Force collection. The collect-a-bowl can hold up to 50 characters and stores them safely when not being played with, which as a parent I love because I forever seem to be picking up tiny toys from my living room floor. Flush Force have been a huge hit in our house and at just £2.99 for the individual toilet bowl (featuring two characters) makes a great pocket money toy! I think these really appealed to James especially as lots of the blind and collectibles are aimed at girls now so these gross creatures really appealed to him and I know he will be wanting to collect more. There are 150 characters to collect all with names that had my two chuckling over and over again, their personal favourites include "Farty Mcfly" and "Crumb Bum". If after opening all their characters your children aren't ready for the Flush Force fun to end then you can also download a FREE app where they can explore Flushville, play games and lots more. If you love the sound of Flush Force and you think your kids would love them too, why not head over to the Spin Master UK Twitter page on Friday 9th February and join in the Twitter party. There will be lots of discussion and information about the Flush Force toys as well as a chance to win a bundle of Flush Force goodies just for joining in! *We received some flush force products for the purpose of this review. However all words, opinions and images are my own and I retain full editorial control of this post." They’re so adorable and fun! I’m exciting for the twitter party, I’ll make sure I’m ready! This is too cute and looks super fun, love all the suggestions. Haha! These look so hilariously gross, definitely something my little ones would love! My little nephew would love these, with his birthday coming up you have given me a great present idea. Omg, what the hell. I bet kids are going to go nuts over these. My niece loves anything collectible right now. My kids are going to love these, they can't resist this kind of collectible. OMG I would have loved these as a kid! They look like so much fun and so quirky, love it!